Not too long ago, RenuzitTriScentsHomeMakeover was launched nationwide. Basically, it is a contest opened to anybody who wants to have chance of winning the $20,000 home makeover with Tanya Memme. 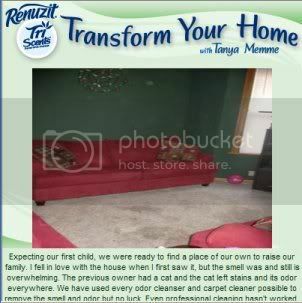 All the participants have to do is to send in a picture of the room or the part of the house that they want to transform with the help of Tanya Memme. Along with the picture should be short video of the reason why it needs transformation. From all the interested parties, 10 semi-finalists will be chosen. The semi-finalists are chosen already. It is now up to the public to decide which of the 10 semi-finalists should get the much needed Home Makeover prize of $20,000. I went to the RenuzitTriScents Website to take a look at the semi-finalist gallery and I should say that it’s going to be one tough competition as those 10 semi-finalists can all use the transformation they want. They have also given very convincing reason as to why they deserve the much coveted prize. But there should only be one winner because it’s a contest after all. After looking at the semi-finalist gallery and reading each reason for a makeover, I am choosing the one that hits closer to home, so to speak. It’s the entry of this couple who are about to become first-time parents. I want them to win because of the baby that’s on the way. I just feel what they’re going through as we were once in that boat. If you want to take part in this contest and make a dream come true, just visit their website. The contest will run until June 7.